In order for me to support my writing activities, I may receive monetary compensation or other types of remuneration for my endorsement, recommendation, testimonial and/or link to products on this blog. Please note that I only endorse products that are in alignment with what I believe in and that would be of value to my readers. 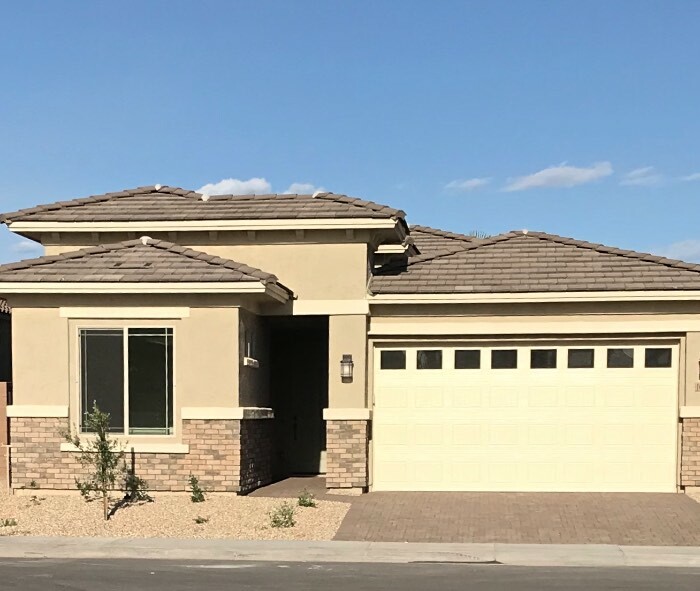 After years of looking at homes for sale in and around Phoenix, and not finding anything that felt right, a new construction home seemed like the perfect idea. We contracted with Taylor Morrison Homes back in October of 2017, and spent the next 6 months waiting for our new home to be finished. During this time I was able to find and secure many products to help create our dream kitchen. Our new kitchen space is truly a mix of some of our favorite items! From the extra-tall, flat-front, maple cabinets with fun drawer organizers, to the white quartz counters and black slate appliances, this room is everything I've always wished for. I absolutely love my new porcelain tile floors, but when it comes to extended comfort while cooking, nothing beats the Gel Pro Elite Mat . I've tried various other kitchen mats over the years and none have provided the comfort and support that the Gel Pro mat provides. 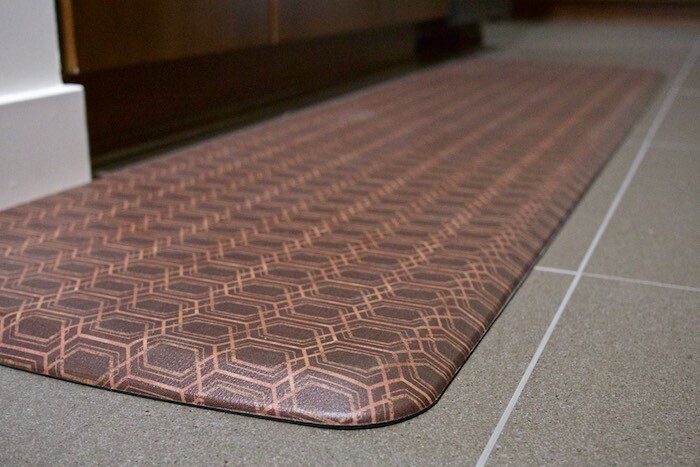 With so many colors and patterns to choose from Gel Pro mats are an ideal solution for your kitchen or for that matter any room in your house. I love this anti-fatigue mat so much that I recently added one to my laundry room. Choosing our appliances was easy, I love the smudge-proof sleek look of the black slate and the professional chef inspired features of the GE Café™series. 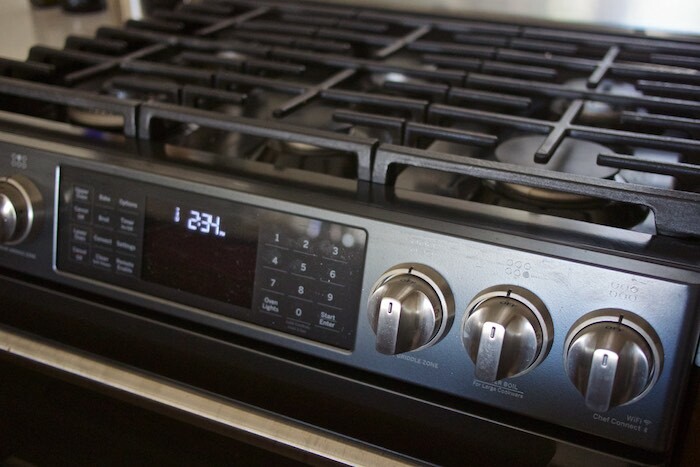 The double oven gas range and convection microwave allows me 3 cooking options for those larger meals we often cook. The edge-to edge six burner cook-top with a tri-ring burner gives me lots of options for searing, frying and sautéing. I'm looking forward to exploring all the chef connect and WiFi features of this appliance line. Having an ample amount of counter space in our kitchen is very important to us. The new space allows for various meal-prep areas throughout. 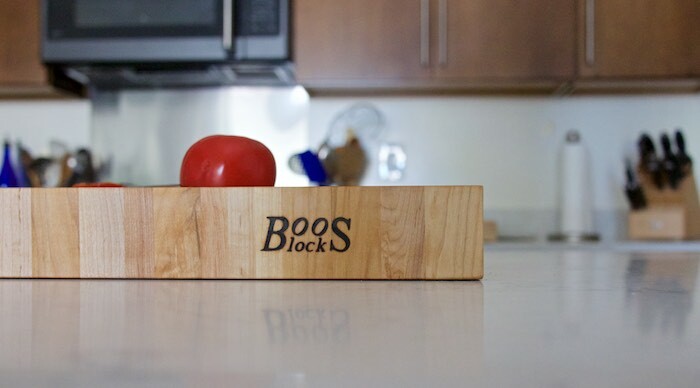 Some of the most-used items in my kitchen, are my Boos Block cutting board(s). These 2 1/4 inch thick chopping blocks sit on my counter (one by the range and one by the sink) and are readily available for serious meal-prep sessions. While it's imperative to have a quality cutting board, in order to protect your knives, it's equally important to house them in a premium block. 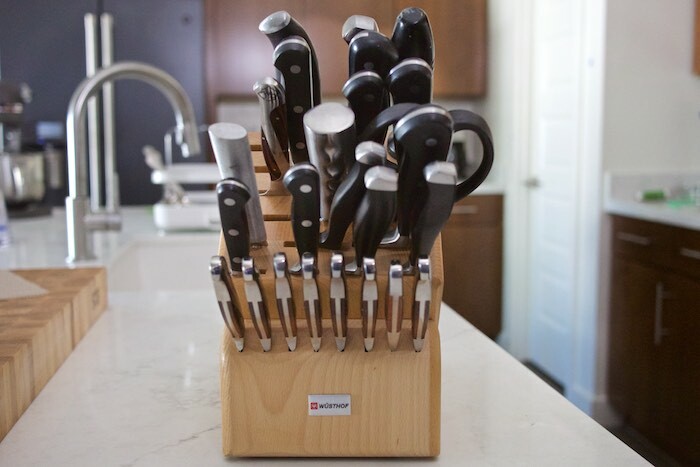 The one I like most is the Wüsthof ® 25-Slot Knife Block. This extra large storage unit has slots for my various knives and my kitchen scissors. On our counter you'll also find our new Kohler Lift Dish Rack. 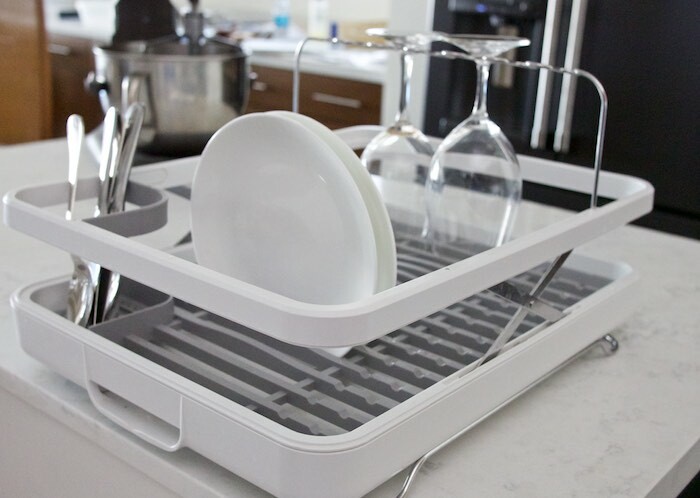 The rack is great for drying those items that don't go in the dishwasher. It also easily collapses so it can be stored out of sight when we have company. Fully stocking a new kitchen with gourmet kitchen products can be fun, easy and very beneficial to the home cook. I hope this post has inspired you to add some new kitchen tools to your collection. Oohhh everythinng looks so shiny and clean! #Goals! I especially love the shape of the drawer and those organizers.... Great idea for tupperwares! Hoping it keeps me organized! Oh my goodness. 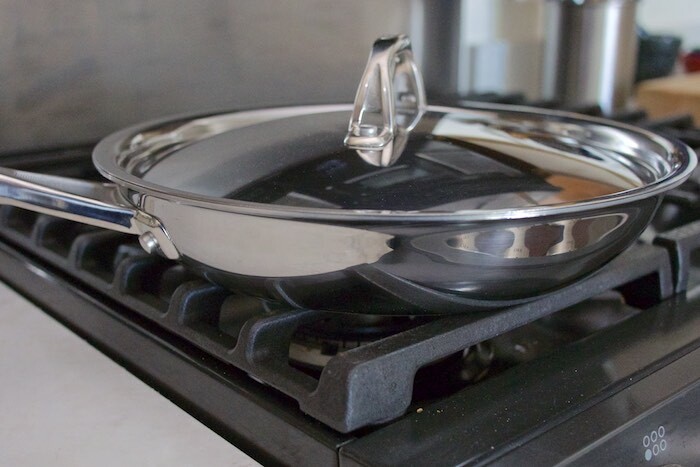 Your stove looks uuuuuhmazing! You have the stove of my dreams. It's all so lovely! Lovely kitchen! And I love Anolon- great cookware! Looks like you got your dream kitchen - how exciting! I have a similar cushy mat in the kitchen to stand on... so helpful! Congratulations! This all looks fantastic. 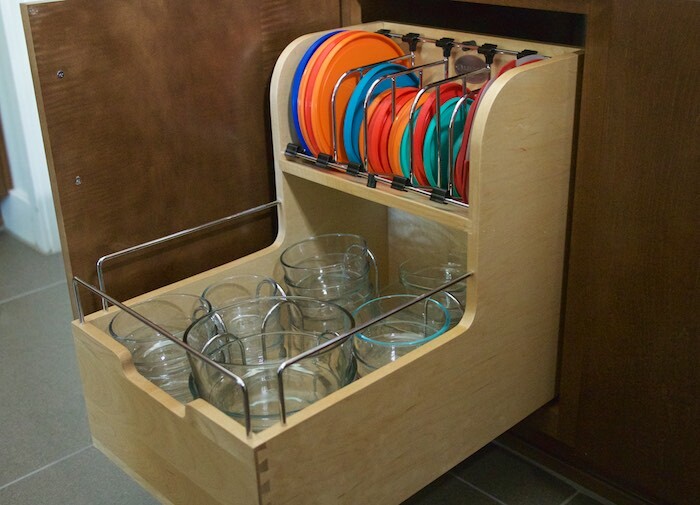 I love that pull-out drawer with the lid rack... great idea! I've considered those gel mats too... so nice when there's lots of prep/cooking to do! The pull-drawer is keeping me organized for sure! The gel mats are a must! There imperative for when you are standing in the kitchen for hours cooking. It's beautiful! Your house is adorable!! Those gel mats look soooo cozy on your feet! I spend HOURS washing dishes so these would be great! Nice home! I love the dish rack. The floor mats look so comfy and super easy to clean. thank you. The dish rack is very handy. How wonderful to have a brand new kitchen! I love the idea of those gel mats. I have a sort of carpet runner that has to go into the washing machine every week and is really looking shabby! I think I need one of those mats! Yes...I agree you need one...I hope you entered the giveaway! Your home- especially your kitchen- is fantastic! I love all the added touches. We have a Gel Pro Mat too and it helps so much when I am standing on tile for hours cooking! The kitchen looks so beautiful. My dream is to have a big big kitchen. The gel mat certainly looks so comfortable and soft. I hate when mats tend slip and bunch up or catch food particles. This one seems so easy to wipe and maintain.